They’re Here! The official 2006 Allandale Neighborhood t-shirts are in and ready for purchase. Thanks to Wendy Wilson and her husband Peter Eckert for the design and having them printed. 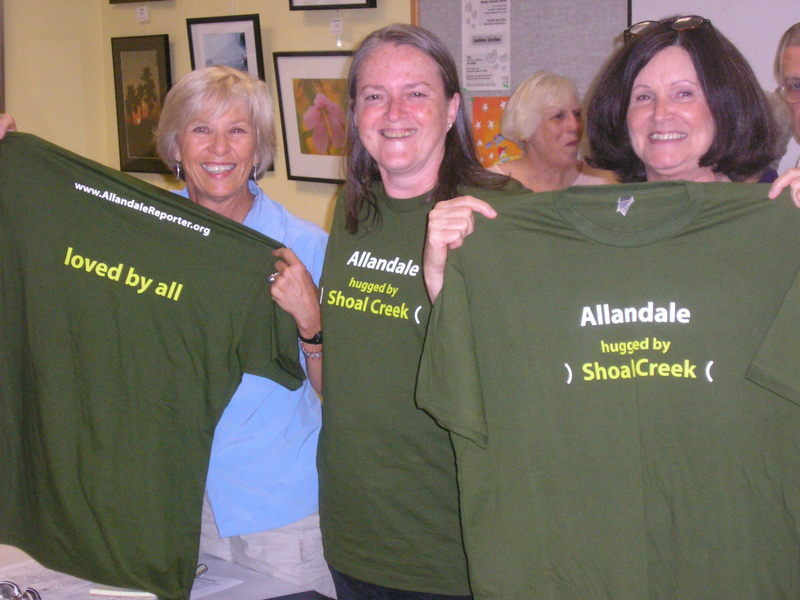 The t-shirt displays the winning tagline submitted by Kathleen Vale O’Hara: "Allandale, hugged by Shoal Creek" on the front, "loved by all" on the back along with the website URL. The women showing off the t-shirt in the photo are Gerry Schwartz, Kay Newell, and Susan Frank. The t-shirts will be available for sale at the 4th of July Parade. The price is $12 or 2 for $20.